With over 50 million users worldwide, Foursquare is a great platform if your business is looking for ways to connect with consumers whose shopping and research behavior is mainly mobile. Restaurants, nightclubs, entertainment venues, and local shops would do well to consider claiming or activating their Foursquare profiles if they don’t have one yet. Foursquare is divided into two distinct apps: Foursquare, to help you connect with customers looking to be matched with outstanding businesses in close geographical proximity, and Swarm, a highly interactive social app that allows users to check-in, notify friends of their location, and locate friends nearby through neighborhood sorting. What types of businesses are most likely to benefit from engagement on Foursquare? And how can you activate and manage your account as a first-time user? Read on to find out. Foursquare makes the most sense for small to medium local businesses in high-traffic areas. High density urban markets like, say, those in metropolitan New York and San Francisco have the highest levels of engagement, but you should not discount this tool even if your shop is in a suburban area. A list of the most popular categories on Foursquare include: fast food, food trucks, vapor shops, wineries, country clubs, ice cream shops, bars, wine bars, golf courses, parks, cafes, night clubs, bowling alleys, stadiums, bakeries, snack bars, ethnic restaurants, arcades, museums, medical spas, and more. Foursquare helps you connect with shoppers in a taste-based and trend-based format, facilitating discovery based on prior preferences and geographic proximity. If you are ready to set up your first Foursquare account, follow the steps below. 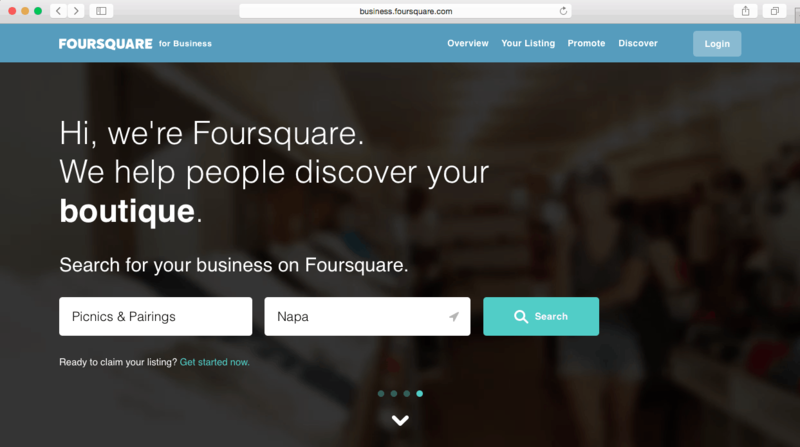 There are two different ways you can activate your Foursquare business page as your own. The first is to create a listing if your business is not yet listed at all in Foursquare. The second option is to claim your existing Foursquare profile. Note that when you claim your existing profile, you will receive a verification postcard via the mail. Verification does not happen automatically. Additionally, businesses claiming a Foursquare profile outside the United States may be subject to a $20 fee to expedite the process. To see if your business is on Foursquare, head to the “Find My Business” page. If you are listed, then you will need to claim your page as your own. If you are listed and you simply need to claim your business, you’ll need to select your venue and click on the button that reads “select.” Next, you will be directed to enter your telephone number for Foursquare to conduct phone verification. The Foursquare verification system accepts cell phones as well as landlines. Once you have entered your phone number, you will receive a phone call from 1-888-755-6020. You will be prompted to leave a recording indicating what type of relationship you have to the business you are trying to verify. Once your voice message has been recorded, you will receive a code via the computer, which will activate all the functions associated with business ownership. Note: If you are an enterprise-level business with more than ten locations that you need to claim and manage, then follow this link. Foursquare can help you claim from 10 to 100 businesses more quickly, or over 100 using a bulk spreadsheet. If your business is brand new, then chances are you are not yet listed on Foursquare. No worries; this is how you get your new Foursquare profile started. Once you have searched for your business, you will get an alert indicating that you are not listed. First things first, to have a Foursquare business account, you must first activate a personal account. Enter basic information about your business, such as the name, complete address, and phone number. Pin your business in the map provided by Foursquare. Indicate if your business is located inside another business, or located in a private home, and acknowledge that you have permission to list it. Select the category and subcategory that best fits your business venue from the dropdown profile. Make sure you include an image. Your image can be your logo or a photo that effectively portrays your storefront. Voila! Your Foursquare business profile is now active. Start creating awareness of your business and capturing new reviews by using the Foursquare decal in a place that is visible to your guests. You can order your Foursquare cling decal here. It’s free. Foursquare is a great tool to facilitate social engagement. Don’t miss out. Make sure you are in the driver’s seat of your Foursquare business profile. Gee, thanks for this tutorial. It’s a great up, and now it’s easy to set up. Thank’s once again! Never even heard of foursquare before! Thanks for this, I’ll be setting up a page for my business ASAP! Soon I’m going to have more listings on review websites that products to sell…. My business is listed, I’ve clicked it on the map and I’ve clicked the title on the left, but no “select” button will appear. How can I claim my business? Not a helpful article considering you avoid mentioning you have to pay $20 for a listing. That’s a pretty obvious omission and makes me question your motives. I’ll keep my business un-verified. I couldn’t tell you one person who has said they use this app and paying $20 to update my listings’ incorrect information is a scam.